In the summer of 2016, Anthony Luvera collaborated with a group of eight young people aged 16-21 years to research self-portraiture at the National Portrait Gallery. 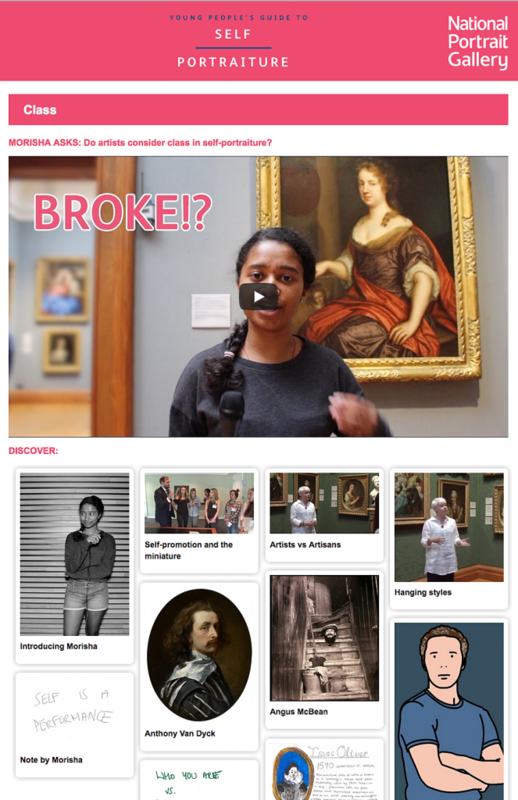 Out of this research they created the Young People’s Guide to Self-portraiture as part of the NPG’s Heritage Lottery-funded project following the acquisition of Sir Anthony Van Dyck’s final self-portrait. Taking Van Dyck’s self-portrait and the gallery’s rich collection of self-portraiture as a starting point, they spent time reflecting on themes explored by artists through the self-portraits they create, such as gender, class, race, representation, and identity. They met and interviewed curators, archivists and staff; discussed self-portraiture together, and created illustrations, drawings and notes about their thoughts and reflections during the workshops. They responded by creating their own vlogs – short films in which they express their perspectives and ideas – and posed questions to engage other young people about self-portraiture. The Young People’s Guide to Self-Portraiture features the participants’ vlogs as well as short films with artists such as Antony Gormley and Gillian Wearing, and written material that expresses their thoughts, perspectives and findings about this enduring theme in art history. Throughout the guide, they invite young people to share their creativity and ideas.